Q. Why is there an entrepreneurial thread that runs through the course and why is it such a focus? A. Entrepreneurship remains a familiar theme throughout Extension, but meanings, perspectives, intentions, and impacts vary. The Leadership in the City curriculum integrates relevant research from the related disciplines of entrepreneurial leadership, entrepreneurial innovation, entrepreneurial marketing, entrepreneurial networks, and entrepreneurial management. As Extension leaders address more diverse audiences, complex collaborations, and rapidly evolving technologies, the field of entrepreneurship offers principles to continuously improve individual, team, and organizational performance. Understanding and improving entrepreneurship in Extension responds to the call for theoretical and practical solutions to today’s complex landscape. For more on the entrepreneurial leadership foundation, click here. Q. Is this course offered for college credit? A. Ohio State Extension is evaluating this option, as well as certificate programs with the Department of Agricultural Communication, Education, and Leadership (ACEL) in The Ohio State University's College of Food, Agricultural, and Envornmental Sciences (CFAES). Q. Who has participated in the Leadership Course? A. 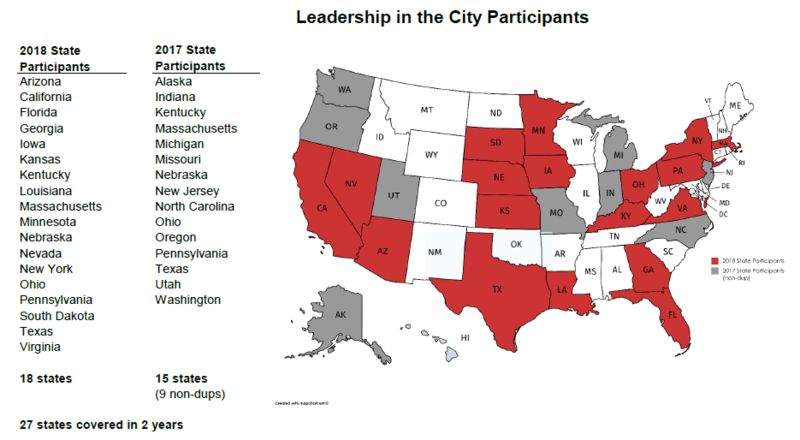 Nearly 50 Extension professionals from 27 states are part of the first two Leadership in the City cohorts. These diverse participants represent all Extension regions. This page will continue to be updated.